We all know that employee engagement is important. Employees that are aligned with their goals, aware of their performance gaps, and motivated to improve, perform better. It’s stating the obvious. The big question is how to get there, and whether technology can help us do this at scale. This is where most digital motivation initiatives hit a wall. A new breed of next generation performance and feedback systems are attempting to do just that: creating and maintaining a continuous personalized conversation between employees and managers with regards to performance, development and goals. In online marketing, personalizing messages and promotional activities has been possible for some time. It is called “Marketing Automation”. Hubspot, one of the pioneers in this field, defines it thus: “software that exists with the goal of automating marketing actions. Many marketing departments have to automate repetitive tasks such as emails, social media, and other website actions. The technology of marketing automation makes this easier”. 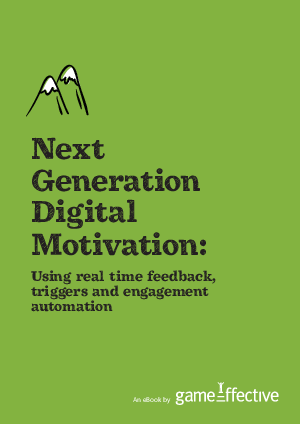 What if we could automate significant parts of the dialogue with the employee about their performance, sending them messages and nudges that are personalized, contain coaching and feedback and drive employees to better performance? What if the main input we’d use for this dialogue was real-time data? What if we could do this without getting into complex and implementation and technology challenges? Welcome to performance management engagement automation. Just like with marketing automation, the core of the practice is about collecting the right data about the audience (employees), segmenting audiences and applying different rules and actions to engage employees with their goals and learning, at the right time and in-context.